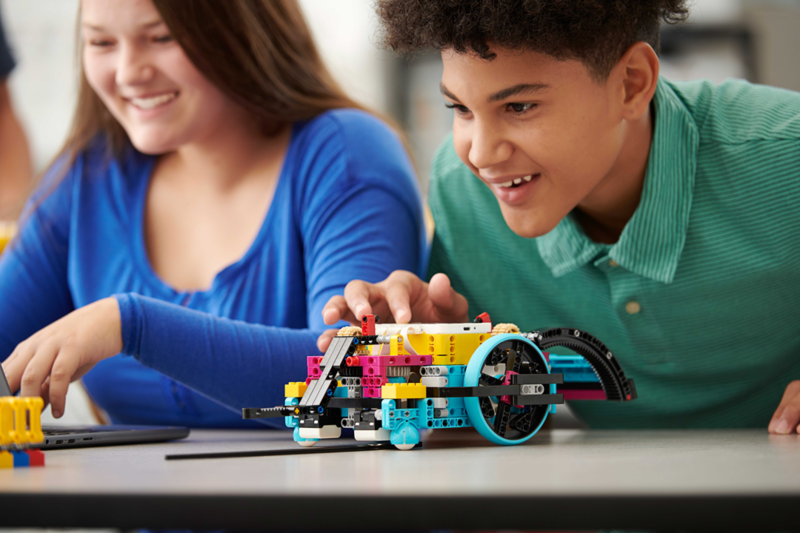 LEGO has announced another expansion for its Education theme, SPIKE Prime. This product is intended to aid in the development of basic coding, allowing students to design and program their own models around a multi-port hub. Not only does SPIKE Prime introduce a new electronic hub, it also features numerous new Technic elements. These include a 2x4 brick with three axle holes, a 1x3x3 connector beam and a selection of large rectangular beam frames. 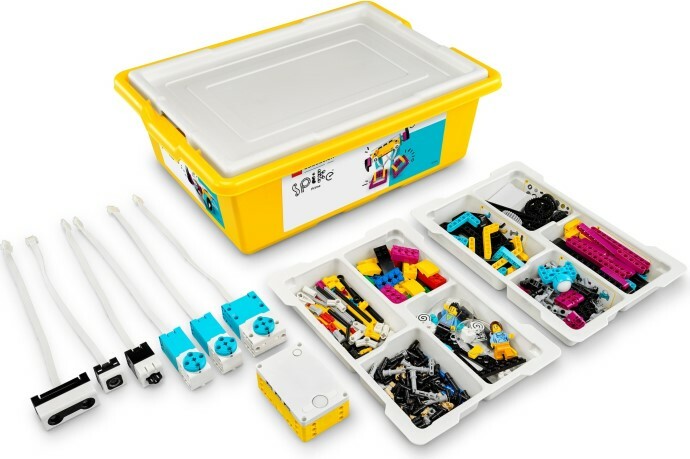 Today, LEGO Education announced SPIKE Prime, the newest product in the LEGO Education hands-on STEAM (Science, Technology, Engineering, Arts, Math) learning portfolio. SPIKE Prime brings together LEGO bricks, a programmable, multi-port Hub, sensors and motors all powered by the engaging SPIKE app based on the Scratch coding language. The SPIKE app includes lessons aligned to certain standards and many being able to be completed within a 45-minute class, making it easy for teachers to take SPIKE Prime into the classroom. 45678 LEGO Education SPIKE Prime set is currently available for pre-order and will be released on the 1st of August. Does this new range interest you and are you looking forward to the new elements introduced with LEGO SPIKE Prime? Let us know in the comments. Hopefully this is finally one system that will work for everyone. That 2x4 brick with the Technic holes is almost exactly what I need for my MOC (though I need a 2x2). Another programming platform? The fragmentation here is getting unmanageable. WeDo, Boost, PoweredUp, Power Functions, Mindstorms, now Spike Prime. No emphasis on interoperability or backwards compatibility. I can cide connect a 1968 brick to a 2018 brick, but not a 2018 power functions motor to a 2018 Boost system. An interesting to note, is that once again, connectors are compatible. This makes WeDo 2.0, Boost, Powered UP, Technic CONTROL+, SPIKE Prime, and 2018 Duplo Trains, electrically and wire protocol compatible. All LEGO needs to do is release an app capable of controlling them all to make them all compatible. I have a feeling this will come. Not immediately, and not soon either. But give it a year or two, and it might come. I'm just loving these luscious new Technic parts. So many cool frames, gears and even a new base brick! Very interesting! The 2x4 bricks will almost definitely find much use. Technic brick?? Sign me up. Here’s my wallet. You can connect Boost and Powered Up parts together already if you're willing to use third-party software. I put a Boost colour sensor on a PU train and taught the train to speed up, slow down, and stop+wait when it detected certain colour tiles on the track. It did require a PC with bluetooth to run the program, but still. Sad that LEGO feels obliged to use the bogus term "STEAM" when the arts have essentially nothing to do with STEM education. If you need a 2x2 brick with axle hole perhaps 90258 will fit your needs. Interestingly, the "Technic, Brick 2 x 4 with 3 Axle Holes" is already on bricklink with part 39789 but has no year or sets associated with it. The color scheme reminds me of the original mindstorms set, even the battery box is yellow just like the old NXT brick. @Polynices: I'd argue that the arts often have quite a lot to do with science, math, and technology, especially as it relates to jobs like those of Lego's own designers—requiring both highly technical and creative/artistic skills working hand in hand. In fact, most successful consumer products result from a collaborative approach between creative professionals, inventors, and engineers. And on the flip side of the coin, a lot of the biggest movers and shakers in the art world today are reliant on math and engineering as well, from filmmakers to sculptors to architects. By now it is easier to just dump the orginal lego electronics and use third party stuff. Tim posted about the 3x3 Technic beam on New Elementary. He was able to find, order, receive, photograph, and post it before they even announced this set, and someone mentioned this new 2x4 in the comments. So, as long as the elements are out in the wild, and they're legitimate, Bricklink will often add them to the catalog. Being able to explain how/where you got them also helps. @Polynices: Please know that I am not attempting to pile on; rather, I am just late to the conversation. I fully agree with Lyichir's comments. The greatest scientific achievements are, of themselves, works of art, and artistic ability aids in the development of scientific architecture. The more these disciplines can be integrated, as opposed to siloed, the greater their potential power. I know I digress here, and perhaps I am an unabashed supporter of liberal arts for this very reason, but I felt it was worth mentioning. For your sake, and as a nod to the liberal arts, I hope there is not an Eteocles member of Brickset. To the other commenters on this thread, I, too have concerns about the myriad platforms. Even if I can eventually find a way to navigate between them, it seems like much to ask of the true market of LEGO--youngsters. August first. Is this going to be the next big release day for new Lego things? Or will every month offer new stuff? So where exactly does this fit in the LEGO lineup? A replacement for WeDo? Or something between WeDo and Mindstorms? Tbose 2x4 sure look like they can appear on other sets as the purple pieces. $330 USD. I know Education sets are pricey, but, yowzers. @cody6269 On the Education site they say WeDo is for “Primary Education” and SPIKE/EV3 is for “Secondary Education”. I fully expect this will replace Mindstorms eventually, or become the new Mindstorms. Will have to see what the consumer version of this looks like. 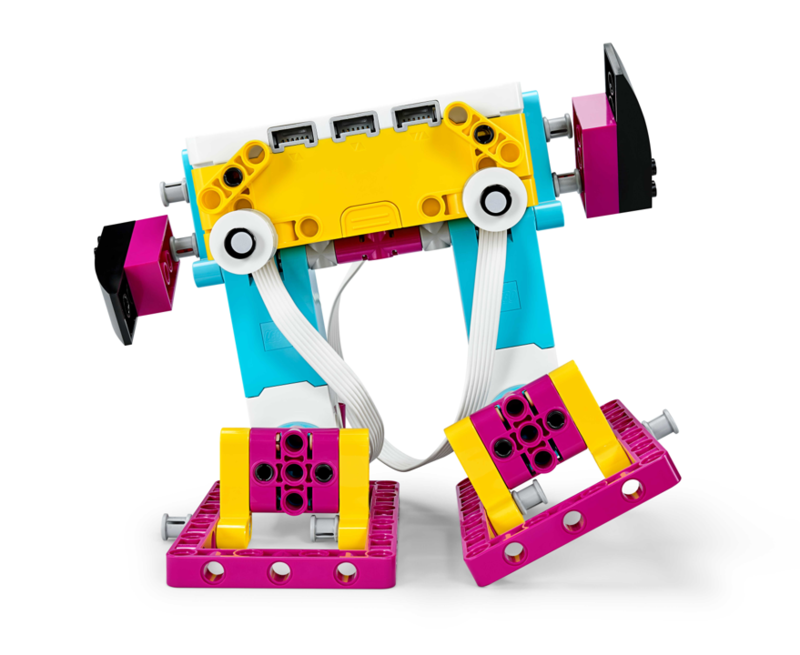 The new part shapes look useful, and the color palette seems very user-friendly and inviting for its educational setting (particularly compared to the aggressively masculine brand identity we often see in Technic and Mindstorms). But I also have a really strong personal taste for Cyan-Magenta-Yellow color schemes, and since magenta in particular is often so rare a color for Technic parts, that's especially exciting to me! I hope it's not too long before some of these parts start to filter into other more widely available themes! A 2x4 Brick with pin-holes, Technic parts in magenta and cyan, a and a handy storage crate with dividing tray? Sounds cool to me! Probably won't get it (the price is likely horrendous) but it's already drawing my attention more than Boost did. @Polynices LEGO is technically an artistic hobby, so if anyone used STEAM and not STEM it would be them. @MrGurt Same. I wonder if LEGO'll cycle back to their early Mindstorms roots? @Aanchir It is a really nice color palette. Reminds me of TV/Computer screen lightbulbs, and works especially well with neon/glow in the dark toys. Surprised no one has yet commented on the utterly fun set number 45678. I like it when LEGO chooses set numbers like that. There's more of these (and otherwise meaningful set numbers) than some people might realize. Lego are making this product area fairly crowded. As I understand it, this set utilises the new PoweredUp/Control+/WeDo motorising architecture with a bigger hub and slots in between Mindstorms and Boost, using Technic bricks but with Boost-type creations and colour pallets but under the Education moniker. They risk making things too complicated, like they did 20 years ago when Mindstorms was a whole range of sets. To me, there seems to be too many variations on the theme but they do at least seem completely compatible and interoperable. That said, the new parts are cool, I look forward to building with them. Did LEGO hire some new people from Nintendo because the name of this thing is awful. I cried...because I was laughing because this hurt so much because Lego just can’t seem to get this right. Oh my buckets of dead lego robots are waiting for their new friends. What ever happened to those beautiful little tiny motors that they used to make?